You've surpassed yourselves this time CG, killing three characters with one nerf. Bravo! 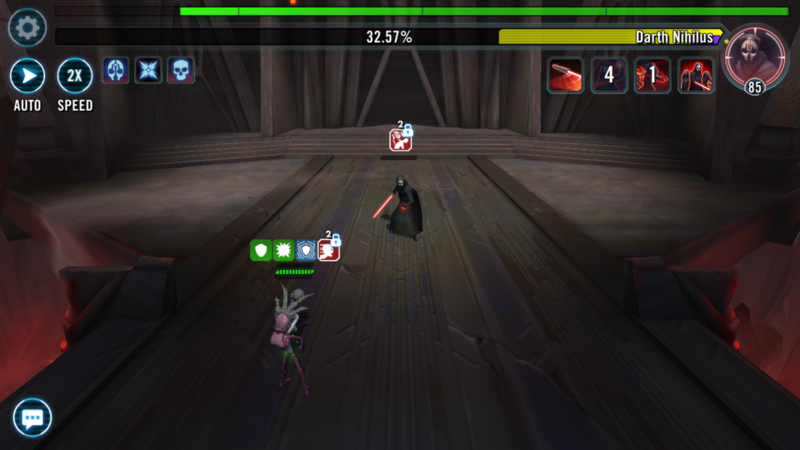 NS rework has caused a Raid Bug in Sith Raid. Here's a screenshot of T6 sith raid in P1. Using all NS squad. I had to restart the app since there was no way I could retreat. FWIW, just ran SAS on an alt in auto, finished all 3 tiers. So now that people are soloing all of Nihilus in heroic phase 1 with the Nightsisters post Zombie rework, what changes can we expect now? Is this a bug? Obviously SOMETHING will be adjusted, but is it Nihilus or is it the Nightsisters again? Phase 1, in heroic? That can't possibly be right. Do you mean Nihilus Phase 1 or Nihilus portion of Phase 3? He means p1'. Which has been noted by crumb, nihilus is stealing zombies -100% speed, so he stops moving, and just stands there while you auto the phase. Really?! Nightsisters are my favorite characters in the game. I really love them. On other hand I could not care less for non canon old republic characters. Soo in your logic, I dislike Old Republic characters, soo all old Republic characters need to be nerfed and maked weak?! Soo just because you dislike Nightsisters and can not beat them, does not mean that they need to be nerfed or made weaker. Farm them, level them, and yours will be powerful too. Do not be a crybaby. Why does Zombie gain a speed stack when you kill another sister and she dies, reviving the sister with one of her the first two kills from her unique. She doesn't gain a speed stack, she loses any negative stacks the first two times she revives from another NS death. Solution: kill any non-Zombie NS twice first. YES! Educated people playing this game! I love it! I also hate when people misuse I could care less, I don't know if it could be a pet peeve or something, but I wanted to congratulate you on your literal sense of the English language. It's great there are folks passionate about grammar but let's please get back on-topic and not focus on the proper usage of phrases or colloquialisms. The fact that half the people say they're nerfed into uselessness while the other half say they're buffed beyond being OP tells me they probably got it just about right. They arent supposed to thrash a zCLS squad 3 other zetas and g11 gear while they had g10 on a couple and g9 on the rest with of course the zetas on the appropriate NS. Im sorry but there is issues when a 70k NS with lower gear beating g12 teams with multiple zetas. This didnt happen until they made the change to the zombie allowing the 2 revives nonsense which has all the hallmarks of zeta and should have been a zeta on any other toon that would have been a zeta. They over tuned the zombie to keep the "NS" discord and all of the NS lovers from crying about nerfing paper zombie. Now because they revive multiple times even after you wade through the zombies you still have to deal with the dead night sisters attacking and possibly reviving. So its literally an 8 or 9 toon fight against 5. NS is complete cheese now. As the guy listed above before the zombie rework NS team had some of the best if not the best statistics and synergy there was absolutely no need for the zombie to revive to a dead NS twice. This actually shows you really don’t understand mechanics or what NS did to upset the CLS meta. The complaint has always been undergeared zombie beating a meta. People cared not to read zombie was not revived, but a completely different zombie, hence, endless horde tag. NS still dominate Traya Phase 3 with fewer restart using Death Storm mechanic. And my 4 Star Bastila and 6 Star GK Arena Team day hi from top 100 amongst the Traya meta. anyone know how to beat an HAAT? Facing a g12 fully zeta'd team in TW. Talzin, Daka, Zombie, Spirit, Ventress. Borders on cheating, I have burned teams that should destroy it. So if anything, NS teams may have taken a hit in the Sith Raid, but anywhere else, they are basically a sanctioned cheat. But such is life. We are talking about all or members making the same team and putting it in North and South Node #1. Fair is fair right? what's to stop your guild from doing the same thing? It's hardly cheating to plave a hard to kill team on defense as a wall. I've faced several in arena with my ep lead arena team and haven't lost to them yet. But only when I drop below 40. 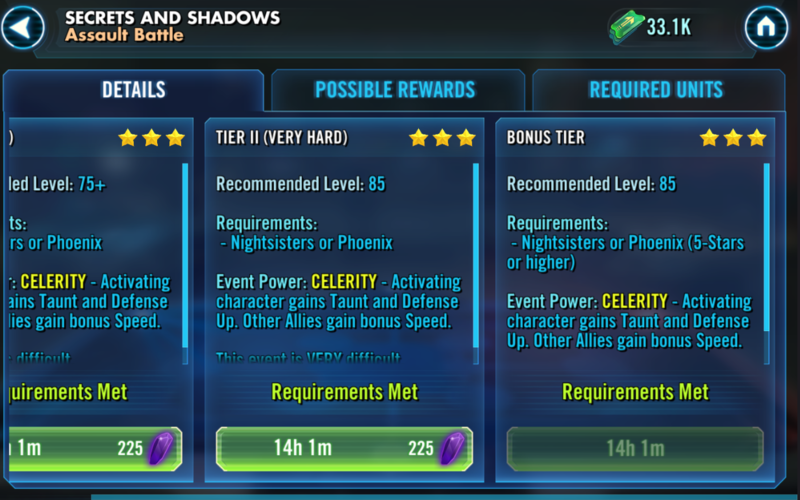 If they were unbeatable, they'd in rop 5 not in the 40s or 50s in my arena shard. Guess you missed: " We are talking about all our members making the same team and putting it in North and South Node #1. Fair is fair right?" I know better than to ask for a nerf, wasted words. Seems like the people who think NS are better are on younger shards. They've been nerfed twice already. If you're just now noticing them in arena, be glad you didn't see them before the sith raid wrecked them. I used to auto every ns team with my zep nightmare (3x g12). Now, I really have to focus on it manually and still only win 60-80% of the time. Maybe its just me not knowing the right strategy, but they are a lot tougher now. So dumb question, but I honestly can’t find anything on the subject. What exacty is a fat zombie? Is she just GS12 maxed out abilities with Def or Health mods? Fast Zombie is obvious. Thanks for the clarification.